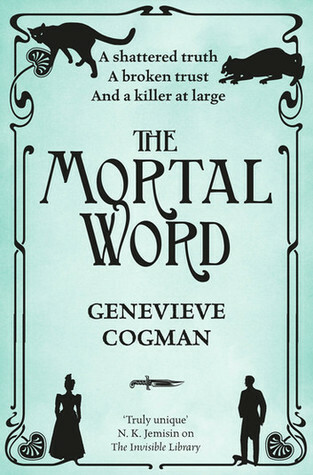 The Mortal Word is the fifth novel in the Invisible Library Series. I happen to be a huge fan of the series, and have been since the start. In fact, a small quote from my review of the Invisible Library adorned the second novel as a recommendation blurb, which I was delighted about when I saw it. So it won't be a huge surprise that I enjoyed The Mortal Word. It's almost a bit like the pre-credit sequences in old James Bond movies: a mini-adventure, featuring action, chases, peril and adventure. For a book about a Librarian Spy, it's a great way to start. After that adventure is over, Irene soon finds herself drawn into the main story. Her friend Vale (a Sherlock Holmes type) is needed to solve a murder at a peace conference between dragons (agents of order) and fey (agents of chaos). Irene is the Invisible Library's chosen delegate to the investigation, and she'll have to work with colleagues from the draconic and fey sides, and Vale, to prevent war, further murders, the end of the universe as we know it, all while trying to solve a murder in a post-revolutionary Paris. One of the nice things about this series is that there isn't huge fluctuation in the quality of the novels. They are all good, pleasant fun. I'd swear that previous books tended to be a little funnier, but it could also be a case of my sense of humour getting rustier since the last book came out. Irene is highly competent but humble and self-conscious, as always, while the main plot is filled with enough action and suspense to keep the reader entertained. It's perhaps a little predictable (I pretty much knew who the baddie was from the start), but that in itself is comforting in a light entertainment read. (It's not as if one reads Harry Potter expecting the overarching story to be unpredictable and full of surprises). I read the book having forgot some of the events from previous novels and had no difficulties with the story, so chances are it could be read as a standalone. The cast of recurring characters is small and the dynamic between them is fairly straightforward. I would still recommend starting with the first book and reading the series in order, as each book follows on from the one before, but a reader starting with this one won't struggle to get into the swing of things. Over the years, I have given copies of The Invisible Library as gifts to friends, and recommended the book to others. The reactions were a bit variable - one friend didn't love it on the first read, but has re-read it twice since then and now really enjoys the series. Another friend disliked the book. When I read The Mortal Word, LJ's negative review was still very fresh in my mind. If you love The Invisible Library series, you might not want to read on, because my thoughts might detract from your enjoyment. The thing is, LJ has a point. One of the criticisms was that every action, every line of dialogue, every interaction between characters isn't just presented on its own. Instead, we get Irene's internal running commentary, wherein she analyses everything, spells out the pitfalls, comes to a conclusion about what to say / do next, etc. So a basic two minute conversation gets treated like an hour long chess game, complete with TV commentary. LJ finds this bad writing. Reading The Mortal Word, it was very noticeable that, yes, there is this foible in the narration. I can see why someone might be bored or frustrated by it, and I have to admit, noticing it consciously for the first time did detract from how much I enjoyed the novel. To some extent, it's the old problem of having a critical side of the brain and an immersive side of the brain, and if the critical side starts piping up, it throws the brain out of the story. It's like eating something and starting to pick apart the flavours rather than enjoying them. So, reading about a bookish woman who is analytical, self-conscious, humble rather than arrogant, who has a collecting streak / bibliophilic fascination, and who doesn't just automatically know what to say, but who has to consciously think about it all the time... and who succeeds at being socially adept even under stress... that is oddly rewarding. Irene may be able to do magic by using the Library Language, but her other superpower, as far as I'm concerned, is to be able not to put her foot in her mouth all the time, and to think her way to the right thing to say before saying it. It's a superpower I would love to have. It's kinda nice to read about a geek who isn't an outcast, about someone who acts and thinks like a person with Asperger's, but quickly enough and accurately enough to avoid messing up. For me, it's not bad writing. It's definitely a foible, but for some readers (probably very geeky ones), it works.